From the photographer's point of view, the main problem of baby photography is the smallness of the subject. The bodies of very young babies are unattractive, so the camera must confine itself to the facial features and expression. This means either getting close, or using a long focus lens, according to the type of camera. If the camera cannot be focused for close-ups, the difficulty can be overcome by using a supplementary lens. Working close to the subject means that the photographer must avoid parallax errors unless he is using a single lens reflex camera or one with automatic parallax compensation. Then the closer the subject, the shallower the depth of field, so that it becomes more difficult, and more important, to focus accurately. The minimum exposure for small babies, unless they are asleep, is 1/50th second, and shorter still for bigger, and livelier, children. Perspective distortion is also apt to be a nuisance at short distances, and the baby's arms and legs must not be allowed to point towards the camera. The baby's eyes are always the best points to focus on- whatever else is blurred, the eyes must be sharp. As a baby cannot understand what the photographer wants, it cannot be expected to co-operate, nor can it be threatened or forced. The only answer is to be patient until the right moment comes naturally. In any case the baby's mother or someone responsible must always be present. 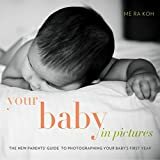 Even if the photographer is on the best of terms with his subject, he will be much too occupied in taking the photograph to act if the baby is in danger of rolling off the table or hurting itself in any other way. 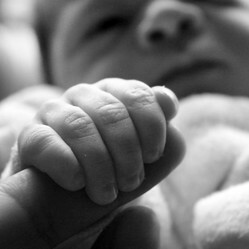 Babies live according to a very strict routine and if it is upset, it makes them unhappy. Also, small babies tire quickly and sessions must be very brief. So the work must go quickly and smoothly. Everything possible must be prepared before the baby is brought into the room. Lights and background should be set up, camera loaded, exposure measured. This leaves the photographer free to watch for the right expression. When it comes, it never lasts more than a fleeting second, and a last-minute change in lighting arrangements or exposure may mean missing a brilliant picture. For indoor pictures, two Photofloods on the subject are sufficient for most occasions, and as they give off a good deal of heat, the baby must be dressed lightly or not at all. It is a good plan to light the background separately, choosing a plain wall or other neutral surface for the purpose. Flashlight can be a most convenient means of photographing baby. Even the small bulbs, or the smaller electronic sets, are powerful enough to permit the use of a small stop. This will give the necessary depth of field at close distances. The general principles of lighting apply to flash too, i.e., to obtain any modelling in the subject, do not use the light source close to the camera. As the camera and flash will be rather close to the baby it will often be sufficient to put the flashlight at a distance of one foot from the lens. This distance should be increased when taking the picture from farther away. With one bulb only, put the baby near the background so that this will also get some of the light. A second flash put behind the baby and directed on the background can be very effective. Flash bulbs are usually coated with a safety lacquer, but there is a very slight chance that they might explode on firing. Always have a safety screen in front of the bulb when photographing babies. Good pictures may also be taken near or in a window by daylight or in sunshine. In this case, since there are no clouds to act as reflectors and light up the shadows, a white sheet or card should be held up as a reflector just clear of the picture area to soften the contrast. When taking pictures out of doors, side (or even back) light gives the best modelling. Here, too, a reflector will improve the picture greatly. The baby's eyes will take more kindly to the light from the reflector than to direct sunlight and will look larger and more expressive in consequence. Most of the routine of the baby's day will make good pictures. The first few weeks are mostly spent in sleeping and feeding, and the baby can be photographed asleep, or in the arms of its mother. The periods of wakefulness at this age are short, so the photographer must work fast. The baby's body does not photograph well in the early weeks, and bathing pictures are best left until later, or at least taken only for record purposes. In the third month the first really lively pictures become possible. The baby uses its hands much more; it discovers things by touch, plays with its fingers or the blanket, and smiles when talked to. Best of all for the photographer, it begins to raise its head when laid face down. This pose must not be overdone, however, and care must be taken to see that the baby's arms are tucked under its chest to support it. As the baby gets older the possibilities for pictures multiply. 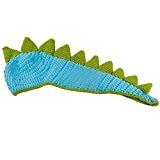 At four months it can hold up its head without difficulty when lying face down; it reaches for toys, and reacts to faint sounds. By this time it looks attractive without its clothes, and since it loves playing in the bath, that is the place to photograph it at its best. A high viewpoint (e.g., standing on a chair by the bath) will give the photographer the best shots, but he must work quickly and have everything ready as the time is strictly limited. At this age the baby begins to hold and chew things (a rusk or a bit of banana) and it will hold other objects in its hand. It can now be propped against cushions and photographed, and there is ample scope for similar pictures on the floor, and in the pram or playpen. From eight months the baby begins to crawl and must be kept still by giving it a toy to occupy its attention, or have its movements restricted in some way, e.g: by sitting it in a high chair. After eleven months it begins to feed itself and may be photographed holding a cup or spoon. There are many possibilities here, but messy foods like chocolate or spinach should be reserved for special effects. From this date its development makes rapid progress, and the opportunities for making pictures increase as it learns first to kneel, then to stand, and finally to toddle. There are endless pictures to be made of its playful moments, its moods, and the regular events of its daily life, and the more automatic the photographer can make his technique, the more of the really significant instants he will be free to observe and capture.